How To Change A Ceiling Fan Light? Ceiling fans nowadays are coming with excellent lighting add-ons. These are a very good option to provide both cooling and lighting for the room where they are installed in. These devices provide a very good option for the interior décor and along with that it gives a classy and vintage look. The fans are a very good piece of machinery to be used in your house. These devices provide an excellent way of cooling along with lighting at a very low price and low energy consumption. They are widely used in the third world countries or the developing nations because the developed nations have their sophisticated and more complex as well as advanced modes of air conditioning. But in countries like India where there is still poverty and the country is still undergoing development the fan is an excellent mode of warding off the heat. First of all, switch off the main supply so that you don’t get electrocuted while repairing the defect. You will require tools like the screwdriver, plier, adjustable wrench so get yourself a toolbox before you start with the repair work. For extra security switch off the switch from your switch board. 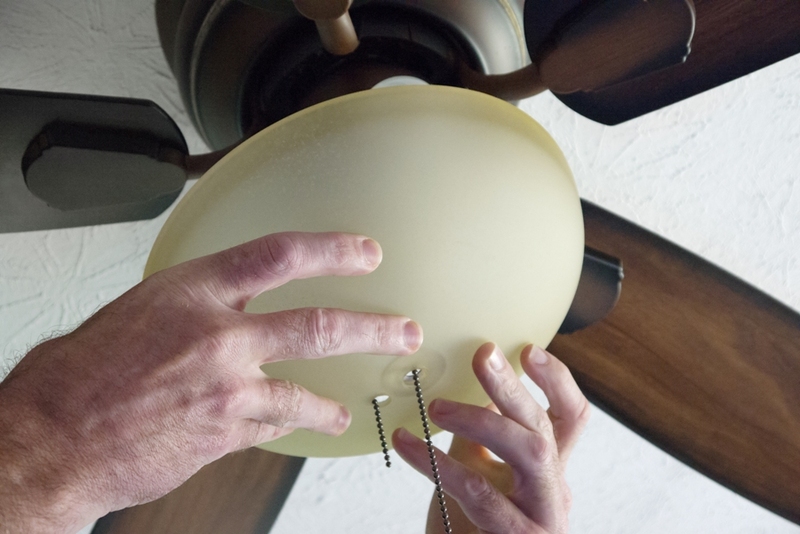 Locate the screws in the fan and using the screw driver unscrew the panel of the lighting if a panel is there or remove the cover if there is one. If a panel is present then the complete panel is separated from the fan when the screws are undone and the wire which supplies current to the lighting unit is the only thing providing support to the whole hanging lighting unit. Undo this wiring and separate the panel completely from the fan. If covered open the holders in which bulbs are to be inserted and change the defected bulb. Please do check the defected bulb to make sure that there is no other problem. Check if the defect has been rectified by connecting the supply wire to a main supply somewhere. Once sure of the removal of the defect close the holders as before and reconnect the wire from the lighting panel to the main supply wire from the fan and insulate it with proper means. Screw the panel back to its original place making sure that each screw has been tightened properly. Check whether it is working or not. In case the fan just has a simple cover then just remove the cover as stated above and change the bulb then and there only. In case the defect is not in the bulb then it becomes a slightly tough job and the lighting panel has to be checked for current flow and it is advised to get professional help in such a case as it involves working with live current. Explore atomberg.com to buy ceiling fans online.